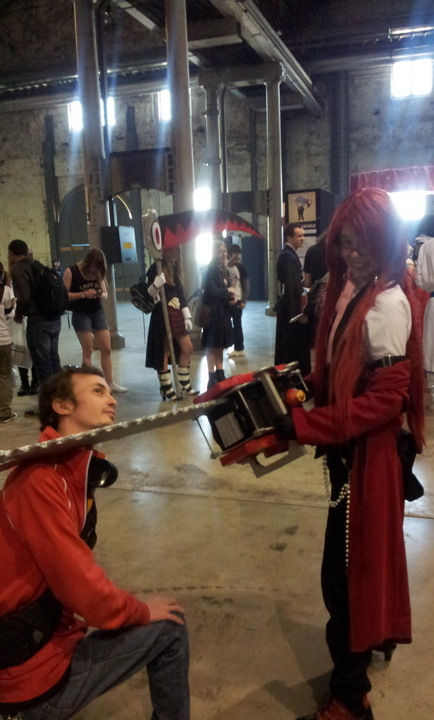 Now I’m sure by now most of you have seen Luke Hallidays impressions of the first day of Animania on our site. Now I want to say that today was really an echo of yesterdays event, only with some minor changes and a whole lot less people. In fact, there were so few attendees that one would not be called out for calling the event a ghost town. What was really confusing for myself, and probably many attendees, was a lack of a detailed map anywhere on the premises. I mean, sure they handed out dungeon maps with every showbag, but I still had no idea where any of the panel rooms were even after examining the map. They certainly weren’t near the show-floor like a person would expect. This then makes me wonder how many people present at the convention actually sat in on the panels. Most of the people I spoke to had no idea they were even running any. This thought actually reminded me of yesterday when Luke and I first entered and how one of the volounteers actually had to enter the show floor to entice people to come along to a panel. Not good. I’ve attended Animania as a paying customer for the two years prior to this and I have to say that the lack of training in the volounteers was less (meaning the volounteers were slightly more trained) back then than it was at this years. However, the volounteers that I spoke to were really friendly and I did meet this one cute Elite Four member that totally owned me in a Pokemon battle. You see, present at the event was a challenge set up for Pokemon trainers to complete called the Elite Four challenge. This is where players would battle against Animania volounteers in a battle that resembles the Elite Four challenge at the end of a Pokemon game. The winners of these challenges would get bragging rights and their name plastered onto a Pokeball in pen for everyone else at the convention to admire. I had no chance. My Pokemon: the second evolution of that fire-pig, that grass monkey and that other one just could not compete. I really wanted to check out the Karaoke free-singing today (and by check out, I mean participate in) but was sidetracked by taking photos of cosplayers. What was really weird was that even though the Karaoke was scheduled to still be running (according to the green block that covered all the way ’til 3PM), at around 2:30pm the room was nowhere to be found. Ah well, maybe next year. 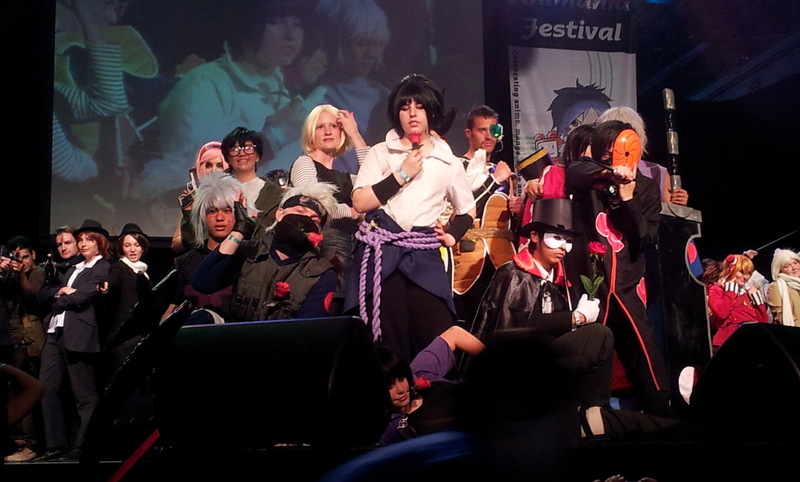 The two cosplay events I attended were incredibly fun affairs. 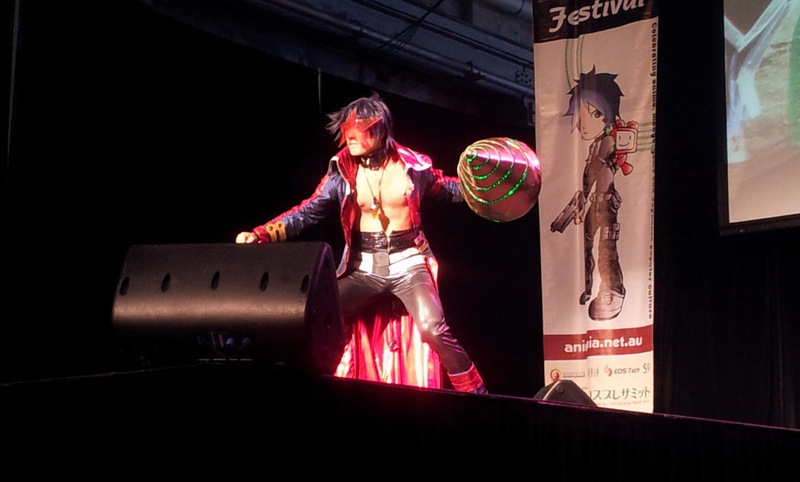 These were the Cosplay Show and the Cosplay Catwalk. The Cosplay Show had entrants perform a sketch for the audience to enjoy, whilst the Cosplay Catwalk was purely for posing. Simon from Tengen Toppa Gurren Lagann was amazing. I want his drill to pierce the heavens! GIGGAAAA DRILLLL BREAKKAAAAA! Apart from those things, I really didn’t see all that much on the day. I gleaned into some of the panels being held on the Chibi Stage, but there wasn’t anything particularly interesting with regard to my tastes. What made it worse for the people running these panels was that the stage was pushed into some obscure corner of the show floor, rather than in a centralised location. To make matters even worse, there were no signs on for the stage until you were standing in front of is door, which there’s no way you’d notice unless you actually saw someone else heading there first. Heck even the movement guidelines on the floor moved away from the chibi stage. Not towards it, away. This really needed to be more centralised and the door placed in an obviously assuming position. Also it needs to be more clearly marked. A piece of paper covered in plastic placed on the door itself does not help the stage in one bit. Overall it feels like Animania is in dire need of a change in leadership. It feels like the team have gotten used to doing everything the same and not changing anything, which is really hurting the convention in the long run. I had a peek at the Animania Facebook page and there are a lot of people saying that they will not be attending again in the future. However, I’m more of the hopeful type and I really do hope that Animania can get their acts together and turn this once legendary convention into the countries top convention. Also, lower the door price. Increasing prices does nothing but draw people away from you. As a hopeful attendee, I really do hope you guys find a way to make Animania fun again. I really, really do. I do not want to see an Anime convention close; but it really feels like this one is going to be heading that way very soon.